One of the culprits to our current obesity epidemic is the larger portion sizes that our food now comes in. We’re all guilty of falling for the “supersize me” deals where getting a bigger size is only a small incremental amount more so we just upgrade thinking it’s a good deal right? While economically it may be a good deal in the short run, we’re paying for it exponentially more later on with our health. That’s why it’s so critical to understand the difference between a portion size and a serving size so you can make informed choices about what you eat. What’s the difference between a portion and a serving? While some people may use these terms interchangeably, they’re actually very different so it’s important to distinguish between them so you can make more informed choices. Portion- an amount of a specific food you choose to eat for dinner, snack, or other eating occasion. Generally, this is the “size” you order at a restaurant or the amount of food they bring out to you. 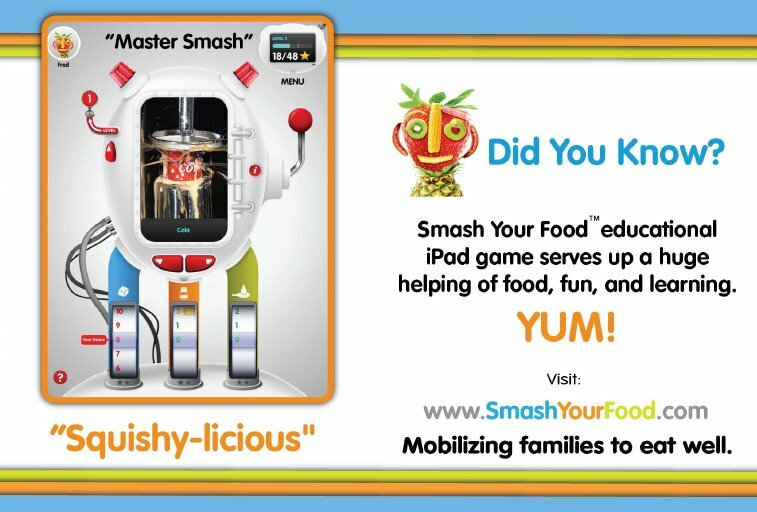 Serving- a unit of measure used to describe the amount of food recommended from each food group. This is the size which nutrition information is also provided on nutrition labels. In an ideal world, our portion sizes should be equal to our serving sizes but unfortunately that’s not the case so it’s our job to know how to make choices accordingly. For example, when reading nutrition labels they can sometimes seem misleading because you may think that the serving size is the entire package, but it may only be half the package so if you eat the entire amount, you’re actually consuming twice the calories listed. 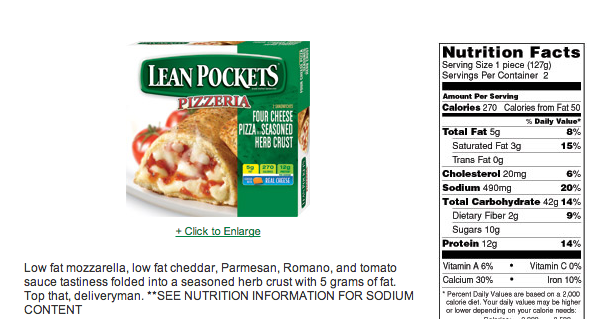 For example, this Lean pockets includes 2 pizza sandwiches in the package but the serving size is just 1 so the nutrition facts are calculated only for 1 sandwich so if you were to eat the entire portion (2 sandwiches) you’d be eating twice the serving size and thus twice the calories listed on the label. This is why it’s so important to know how to distinguish between a portion and a serving. How much have portion sizes really changed? 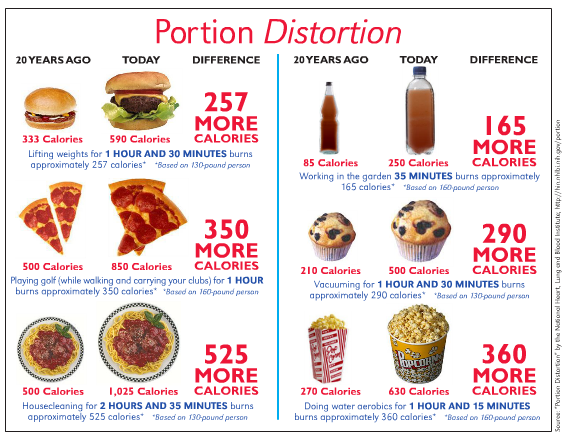 Over the last 20 years, we’ve seen a pretty dramatic increase in the portion sizes of today– resulting in quite a significant increase in our caloric intake. Take a look at a sample of foods that have about doubled the amount of calories we consume just because of the increased portion size. Read labels carefully! Remember that potions are not the same as a serving and that labels are based on serving sizes so make sure you double check the serving size when you make your choice about portions to eat. Since today’s portions are often more than we need, consider boxing up half your meal for later prior to eating to prevent overeating. If you order larger sizes to save money, try sharing it to eat a more reasonable portion. Think about just ordering a small or half portion if you can’t share or don’t want to take leftovers home. Eat slowly– it takes about 20 minutes for your stomach to send signals to your brain that you’re full so if you slow down when you eat your body will tell you how much you should be eating.